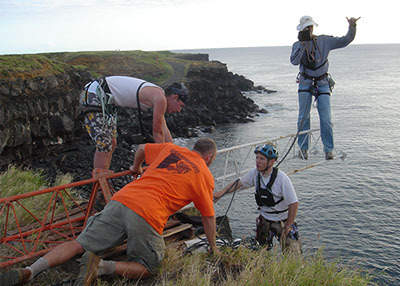 The Climb Aloha team is your professional in-house source for industrial, commercial, adventure sports, and film rigging. Our experienced team hails from a variety of vertical backgrounds to provide you with a wide range of unique expertise. Absolutely committed to 100% safety and efficiency, we can work with any budget to get the job done right the first time. Contact us about your indoor or outdoor rigging and mountain filmography needs for anywhere in the Pacific region.